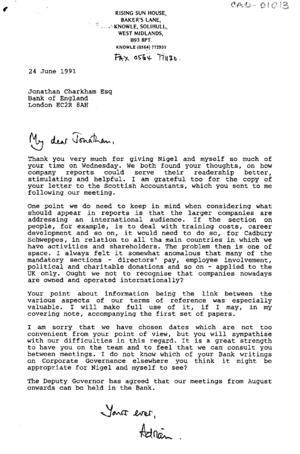 Cambridge Judge Business School : The Cadbury Archive : Letter, dated 24 June 1991, to Jonathan Charkham following their meeting. Letter, dated 24 June 1991, to Jonathan Charkham following their meeting. Puts a point of view on the types and amount of information that should be required, remembering that many companies operate internationally.